Indulge in a luxury experience with the world's largest upper premium cruise line! Experience the world with Oceania Cruises. 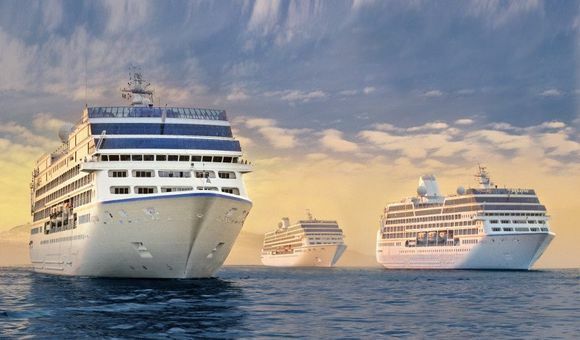 Oceania Cruises is a high-end premium cruise line known for its relaxing atmosphere and excellent service. Offering a serene, adults-oriented cruise experience, Oceania is popular among refined adults, solo travelers, and couples looking for a romantic retreat. Its destination-focused programs make it perfect for adventurous travelers, and many itineraries stop at unique ports of call, meaning even the most seasoned world traveler will have a chance to experience something new. Considered a luxury cruise line, Oceania Cruises is known for its gourmet dining and its professional service staff. Expect to be pampered during your voyage by a highly attentive staff who will do their best to make your stay as pleasant as possible. The excellent staff-to-passenger ratio means more personalized service, particularly on the smaller ships, and you’ll leave feeling like you’ve been treated like an honored guest. And the dining? Top-notch. Specialty dining and wine tasting come included for most cruises, making these activities something you won’t want to miss. Oceania Cruises is considered to be an upper-end premium or low-end luxury cruise line, and has been voted best value for money. The Marina is the flagship of the new Oceania class and combines comfort with luxurious facilities and unique culinary delights. Discover the world’s oceans on one of the finest cruise ships! The Riviera has been designed with luxury and elegance in mind. Inspiration has been taken from previous Oceania ships, with newer amenities added in order to ensure that passengers have a magnificent cruising experience. You’ll feel right at home on the flagship of the fleet! A wide range of features and a courteous service will make your cruise aboard the Regatta an unforgettable experience. The Nautica is comfortable and tasteful with a wide variety of amenities will make you feel right at home in your cabin, and visits some of the most beautiful places in the world so you can enjoy your dream cruise. Comfortable and tasteful interiors as well as numerous amenities will make you feel right at home in your cabin. With 684 passengers our 400 crew members will give you a high level of personalised service. The Miami-based world’s largest upper premium cruise line is known for re-inventing luxury cruising. Oceania Cruises successfully combine the feeling of a country club atmosphere and sophisticated elegance with the adventure and flexibility of sea travel. Oceania Cruises offers some of the most exciting and exotic itineraries, visiting extraordinary ports around the world. This is a cruise line that specializes in providing the ultimate exclusivity for all its passengers. No matter which cruise ship you choose, Oceania Cruises has put a great deal of effort into ensuring its casual country hotel atmosphere. Lavish lifestyle and high-quality standards are present aboard these 5-star elegant vessels. Though it is far from home, you would love to discover Australia and New Zealand? Oceania Cruises couldn’t make it easier for you by offering cruises with the reliable, elegant and luxurious Sirena. The charming Marina or the marvelous Nautica will be your best cruise ships for the well-deserved relaxing vacations thanks to their superb spa treatments available onboard, from acupuncture to body wraps and massages the eastern inspired treatments. In case you are not impressed by majestic staircase in the atrium or the Ralph Lauren furnishings in selected staterooms, attend one of the arts or cookery classes. And all under the same roof – Riviera is tailored made for you! Whether you are traveling alone or with your significant one, Insignia will impress you with its awe-inspiring facilities and proud variety of exciting and exotic worldwide itineraries. Another sleek and elegant vessel, Regatta will astonish you with its magnificent design and its outstanding lounges, suites and luxurious staterooms. Choose from cruises in Asia, Australia, Europe and transatlantic or repositioning cruises. Explore the world in style with Oceania Cruises! For further information regarding sailings with Oceania Cruises in 2019 or to check the latest fares and availability, please call our cruise experts on 1-888-403-1425.